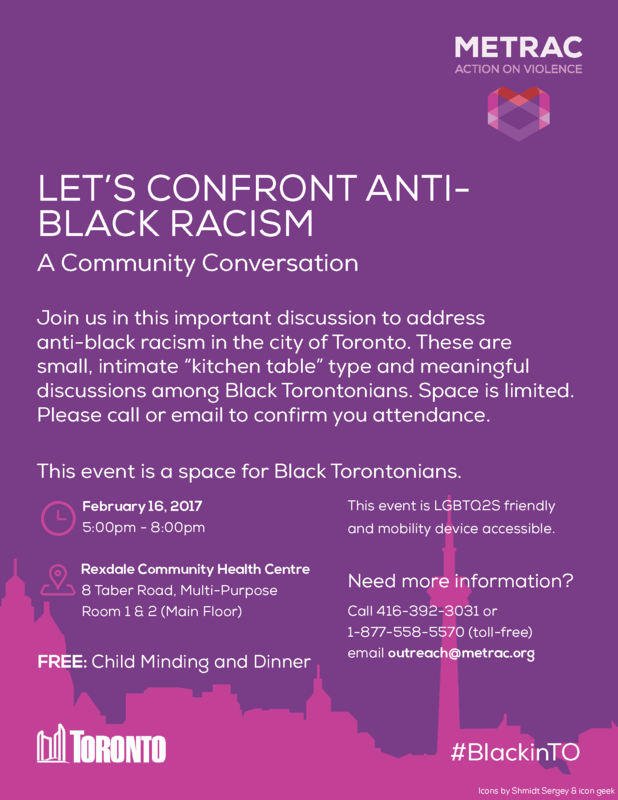 WHAT: Join us in this important discussion to address anti-black racism in the city of Toronto. These are small, intimate “kitchen table” type and meaningful discussions among Black Torontonians. METRAC is one of 11 agencies that has been asked to run black-focused conversations with the goal of providing community input for the city of Toronto’s Action plan on Anti- Black Racism. Whether you are concerned about policing, access to city services, carding, or youth programming, we invite you and your agency to be part of the conversation. Space is limited. Please call or email to confirm you attendance. WHERE: This event will be held in Multipurpose Room 1 and 2 on the main floor of the Rexdale Community Health Centre, in Etobicoke (8 Taber Road).